It doesn't take much to know when you've scorched your iron, because the burned fabric smell is hideous. Fortunately, scorched irons can be cleaned fairly easily. If you learn how to clean stained sole plates, it's possible to salvage an iron that has been scorched. When you burn the bottom of your iron, the first thing you want to do is unplug it. If you can't remove the scorched fabric from the bottom of the iron in one piece, then use a pair of tweezers or wooden chopsticks to lift small bits of melted material from the sole plate after the iron has cooled completely. If you don't remove all the burned fabric from the iron, the appliance will not work well. Take care to remove all the material and then clean the scorched iron with one of the following techniques. If the scorched marks are really bad, you will need to be more aggressive in your cleaning efforts. Instead of salt, heat up some white vinegar and dip a soft cloth in it. Next, gently wipe the cloth on the scorched sole plate until the marks are gone. Finish by wiping the bottom of the iron with a cloth dampened with clean water. If vinegar alone does not erase the marks, then you will need to mix a few teaspoons of table salt or baking soda with the hot white vinegar. Stir the mixture until the salt or baking soda dissolves. Soak a clean cloth in the cleaning solution and then wipe the iron's sole plate. Continue wiping until the stains are gone, and then clean the bottom of the iron with a clean, damp towel before storing. If your iron has a nonstick sole plate, then you have the option of cleaning the marks with a little liquid laundry detergent. Simply add a drop or two of detergent in a small bowl with warm water. Next, dip a clean cloth into the solution and scrub the sole plate. Finally, dry the bottom of the iron with a towel before using the appliance again. There are times when scorch marks cover iron vents. To clean this type of mess, combine water and some gentle dish soap, such as Ivory, to create a soapy mixture. Dip cotton swabs into the cleaning solution and rub on the scorched sole plate and in the dirty vents. Once the stains are gone, use a clean cloth to dry the iron. 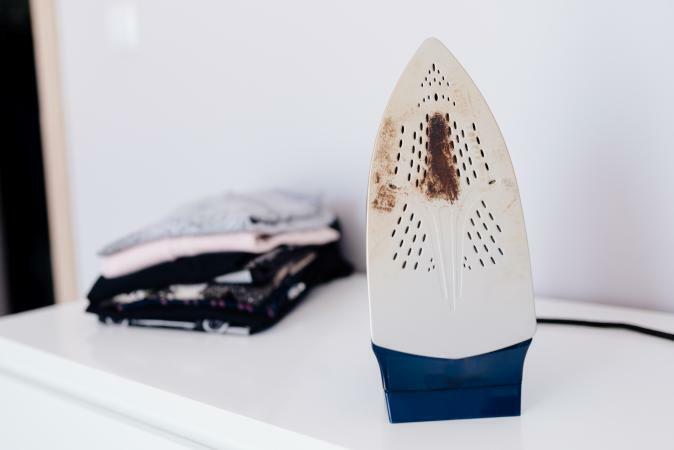 A simple way to clean a scorched iron is to soak a rag into hydrogen peroxide, place it on an ironing board and iron over it until the stains lift. If you scorched an iron that does not have a coated iron plate, then you can salvage it by applying a few drops of metal polish solution on it. Rub the polish on the scorch marks with a rag until they disappear, then get a clean cloth and wipe off any damp spots. Prior to experimenting with any of the aforementioned cleaning techniques, it is a good idea to read the iron's owners manual first. The manufacturer may have additional tips on how to remove scorch marks. In addition, the instructions may also feature a list of cleaning solutions that are not recommended for use on your iron. The nail polish remover does not have to be acetone. Other chemicals work just as well. Always test a small section of the iron before attempting to clean the entire heating surface. Never use any heated chemicals or strong smells around pet birds. If you have birds in the house only use this method outside. Many fumes are dangerous or deadly to birds. Have all of your materials at hand, and only work on a stable foundation. There must be good ventilation - and this method is best handled outdoors. The iron will be very warm as it heats and after cleaning (until it cools). Be careful to avoid getting burned and do not inhale the fumes. The fumes are toxic. Heat the iron to the lowest setting only. Dip a Q-Tip or rolled rag into the nail polish remover. Carefully rub at a section of the burned area. Use a clean section of rag or Q-Tip once the edge has become soiled. Once the entire iron is cleaned, dampen a cloth in clean water and rub the bottom. You can also lay the damp cloth flat and "iron" that to remove any leftover debris and burn marks. This less toxic and more pleasant method involves a trip to the grocery store. Lime juice works quite well at lifting burns from the iron. The acid from the lime and the gentle abrasive action of the baking soda will leave your iron looking like new! Simply squeeze one lime and add enough baking soda to make a paste. Place the paste on the soiled areas of the iron. Leave on the iron (cold, not heated) for at least 5 minutes. Test a section after 5 minutes to see if the paste is lifting the stain. Gently rub the lime and soda paste until the bottom of the iron is clean. Wipe the excess paste with a damp cloth and allow the iron to air dry. You don't have to make a special purchase of limes if you have some good old-fashioned white vinegar waiting in the cupboard. Make sure the iron is off and the heat plate is cool. Mix a half cup of vinegar with a half cup of water. Fold a rag or cotton ball and dip this into the vinegar and water solution. Add a sprinkle of baking soda to the wet spot on the rag (this is your abrasive), and gentle begin scrubbing the burn stains. Use a circular motion and a little bit of pressure to lift off the stains. Simply wipe off the excess with a damp cloth. Both the vinegar and the lime juice (acids) react with the baking soda creating a fantastic stain busting duo. This combination is not a chemical; it is non-toxic and it works great. While melted candle wax is a "problem" when it spill on carpets and table cloths, it is a bane for cleaning burnt spots from the plate of an iron! It is an easy method too. Set the iron to the lowest setting. Be careful to not touch the plate - it is still very hot. Rub the candle over the burn marks and scorch stains. Using a thick cloth (you can protect your hands by wearing oven mitts), apply pressure to rub the wax and the stain off the iron. 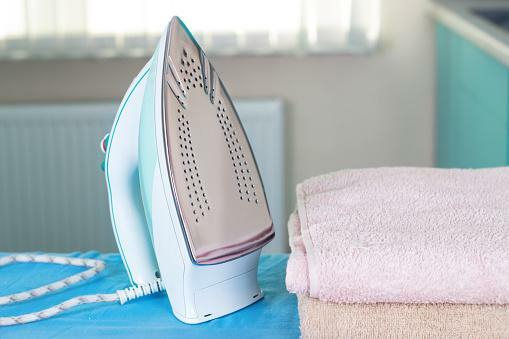 Wipe the iron clean by setting a thick, dampened cloth onto a flat surface. Iron the cloth to "wipe" off the remaining wax and to create a shine on the iron's plate. Faultless Hot Iron Cleaner - This non-toxic cleaner removes stains, burn marks and puts a shine back on the appliance. It is used on a hot iron. Purchase this at an appliance or grocery store. It is also available online. Prices range from about $7 to $10. Rowenta ZD 100 Steam Iron Cleaner - Rowenta is similar to the Faultless cleaner. 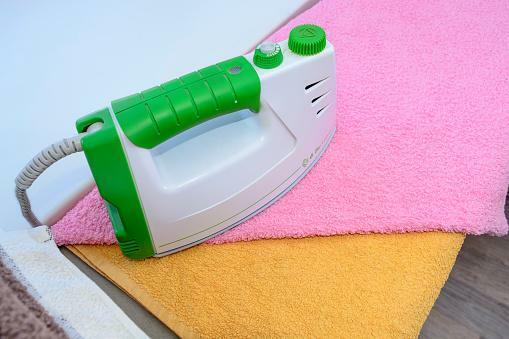 Both restore the plate of the steam iron and clean off grime, build-up and burn stains. The Rowenta product is available online and in stores. Prices range from $9 to $10. Whink Steam Iron Cleaner - This product cleans irons as well as faucet heads and other places were grime or mineral deposits accumulate. It shines the iron plate, removes debris and water stains (build-up). Whink products are found in grocery stores and larger establishments such as Walmart. Prices range around $5 to $9 (depending on size/multi-pack). One of the best ways to avoid deep cleaning your iron is to never turnit on and leave it unattended. Not realizing how hot an iron is when you press clothes, linens or other materials is a sure fire way to accidentally scorch a sole plate. Also, to keep your iron in tip-top shape, be sure to clean it on a regular basis to prevent materials from building up and clogging vents. Don't use abrasive cleaners or scrub brushes to clean a scorched iron as you can easily damage it further in the process.